"This two-day event will feature more than 35 different speakers from the food and agriculture field, interactive panels moderated by top food journalists, networking, and delicious food, followed by a day of hands-on activities and opportunities for attendees. This is the second in a series of three two-day Summits in 2016 which will bring together some of the world’s most impactful food system leaders. Earlier this year, the Washington, D.C. Food Tank Summit completely sold out and drew in more than 30,100 livestream viewers. This is a can’t miss event for 2016!" "Locals" are able to attend the conference for $129 for one day or $249 for both days. When I remarked on Facebook that the event was beyond my financial means to attend, several fellow small-scale farmers and ranchers made similar comments, while meeting organizers encouraged us to attend. I fully realize that this event is organized by well-meaning and passionate people, and the list of speakers is quite impressive. But as a grizzled (can a bald guy call himself grizzled?!) veteran of Placer County's local food movement - and especially as someone who has tried (and failed) to make a full-time living from raising sheep - I guess I am a bit disappointed that the list of speakers doesn't include more folks who have struggled to build an economically viable and ecologically sustainable farming or ranching operation. While I certainly don't know all (or even most) of the speakers on the program, I suspect that none of them have had to decide which bill (either business or household related) not to pay this month, or whether they can afford new tires on the truck before winter. One's definition of small-scale farming depends on one's perspective. Before drought and economic reality forced us to downsize our flock, we had built our numbers to over 300 ewes - which was still not nearly large enough to pay me a full-time wage. Some of our farmers market customers at the time thought 300 head of sheep was a large operation - and they were even more astounded when I told them that I'd need to run 800-1,000 ewes to pay myself the median wage for Placer County (approximately $35,000 per year). While I haven't seen an actual agenda for the Food Tank Summit, I imagine that there will be a great deal of discussion about policy changes and infrastructure improvements that will help "small-scale" farming operations. In my experience, when livestock production is discussed at these types of events, the conversation invariably turns to the perceived need for more small-scale meat processing capacity. As a meat producer, I think we're chasing the wrong goal. No matter where I process my lambs, I still need to be at a large enough scale to be economically viable. 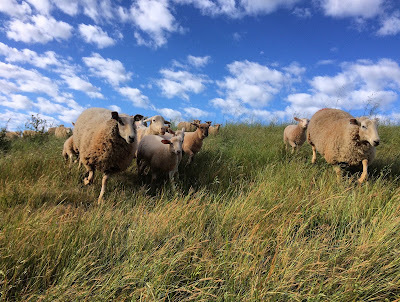 Several years ago, I determined that I could pay myself that $35,000 per year wage from 200 ewes if my customers were willing to pay $35 per pound for a whole lamb (which would make each lamb worth around $1,000). Not surprisingly, I haven't found anyone willing to pay that for my lamb (even though they're quite delicious and humanely raised). In other words, being able to get my lambs processed closer to home makes a VERY marginal difference to the economic viability of my business. The primary barriers to expanding our sheep operation are access to land, access to capital, and efficiency of marketing. For the viability (and sustainability) of my business to improve, these barriers must be addressed. At least in our part of the Sierra foothills, land is valued well beyond its ability to grow grass. Even the most productive irrigated pasture doesn't produce enough forage to justify paying the typical asking price for real estate - and unirrigated rangeland is even more overpriced as compared to its agricultural productivity. And price is only one component of land access. Much of our region split into relatively small parcels. This fragmentation presents a number of challenges - for example, we currently graze on about 400 acres (about 20 acres of which are irrigated). At last count, we work with 20 different landowners on this 400 acres. While our landlords are great, coordinating our grazing across 20 different ownerships is complicated. Crossing from one property to another over (or around) a property that isn't part of our operation is also complicated. And grazing animals require a significant amount of land - our current land base supports approximately 80 ewes. I'm not sure we could find enough land in close proximity to our current operation to support the 800-1,000 ewes necessary for a full-time business. Even if we had access to enough land, we'd need to put together enough sheep to graze it - which takes significant capital. Purchasing 1,000 ewes would likely cost close to $200,000 - and that doesn't include fencing, equipment, livestock guardian dogs, and other capital costs. Finally, direct marketing is very enjoyable - I've always found direct interaction with my customers to be fulfilling and rewarding. Direct marketing is also terribly inefficient. To market all (or even most) of the lambs from 800-1,000 ewes, I would need to go to at least 5-6 farmers markets every week - 52 weeks out of the year. Conversely, I could hire someone to cover the markets (which, in my experience, would mean lower sales volumes in each market - people want to buy from the farmer, not his or her employee). Access to Land: local government and non-governmental organizations in Placer County are focused on land conservation, including farm- and ranchland conservation. In some cases, these entities have purchased or accepted conservation easements on agricultural land, which at least ensures these lands won't be subdivided. In other cases, lands have been purchased outright. I think we need to go a step further - we need a program through which the community purchases large-scale farms and ranches from willing sellers. These lands could be made available to commercial farmers at an affordable lease rate. We could even create a local, modern version of the Homestead Act - a long term (20+ year) lease or life estate on the farm- and ranchlands owned by agencies or NGOs could be provided to families who agree to make agricultural improvements on these lands. In any case, we need to end the fallacy that splitting a working farm or ranch into 5 acre ranchettes keeps the land in agriculture! Access to Capital: commercial lending institutions (and to a large extent, USDA credit programs) are geared towards large-scale loans rather than towards meeting the needs of small-scale farming. For example, I talked to an agricultural loan officer in my bank who told me they didn't generally make agricultural loans of less than $250,000. The business lending officer wasn't comfortable with the risks inherent in farming - so a smaller loan would have cost me substantially more in interest. I think crowd-funding and community lending pools might be the answer. Finding a way to make capital affordable - and a way to give the community some direct financial involvement in its own food system, might help small growers invest in their businesses. Collaborative Marketing: personally, I like the term "cooperative," but the failure of several California marketing cooperatives (Tri-Valley Growers, for example) in the last 20 years makes it a dirty word in some farming circles. That said, I think we need more collaboration. Consumers consistently tell us that convenience is a real barrier to eating locally grown food - some folks simply can't get to the farmers' market. On the flip side, I don't know of any small-scale farmer who wants to go to more farmers' markets each week - especially without some guarantee of sufficient sales volume. Larger ranches have joined strategic alliances with marketing/processing firms - maybe we need to look at a similar model for small- to mid-sized ranches. Last weekend, a friend came out to the ranch to help us go through the ewes to determine which we will keep and which need to be culled this year. Towards the end of the day, she asked, "So are you living the dream - getting to work on the land and with livestock?" Over the last several days, I've thought about my answer to this question. I absolutely love the work of being a shepherd - of caring for animals and for the land, of producing food and fiber for my family and community. I love this work enough to continue to do it even while working a full-time off-ranch job and completing a master's degree. But I can't say that I'm "living the dream." My dream would be to make my living raising sheep. My dream would be to make enough money from raising sheep to put my daughters through college. My dream would be to own at least part of the land that I graze with my sheep. My dream would be to replace my pickup when it turns over 300,000 miles sometime in 2017. At least for now, fulfilling my dream has proven to be elusive. I hope someone at the Food Tank Summit at the end of the month addresses these everyday realities. Note: for some additional perspective on Sacramento's farm-to-fork activities, check out this op-ed piece from the Sacramento Bee.